Education in the Global South faces several key interrelated challenges for which open educational resources (OER) are seen to be part of the solution. These challenges include unequal access to education; variable quality of educational resources, teaching, and student performance; and increasing cost and concern about the sustainability of education. The Research on Open Educational Resources for Development (ROER4D) project seeks to build on and contribute to the body of research on how OER can help to improve access, enhance quality, and reduce the cost of education in the Global South. 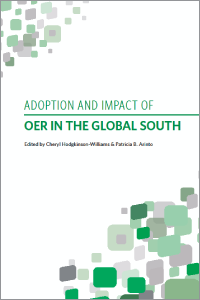 This volume examines aspects of educator and student adoption of OER and engagement in open educational practices (OEP) in secondary and tertiary education as well as teacher professional development in 21 countries in South America, Sub-Saharan Africa, and South and Southeast Asia. The ROER4D studies and syntheses presented here aim to help inform open education advocacy, policy, practice, and research in developing countries. Cheryl Hodgkinson-Williams is an associate professor in the Centre for Innovation in Learning and Teaching (CILT) at the University of Cape Town, South Africa and the principal investigator of the IDRC-funded Research on Open Educational Resources for Development in the Global South (ROER4D) project. Patricia B. Arinto is a professor and former Dean of the Faculty of Education at the University of the Philippines – Open University (UPOU). She is the theme advisor for the massive open online courses (MOOC) research in the Digital Learning for Development (DL4D) project and the deputy principal investigator of the ROER4D project, both of which are funded by IDRC.